I spent all weekend moving my stuff and helping a friend who was also moving. We decided to treat ourselves to manicures since we were a little beat up from the weekend. After mine were done the color reminded me of Va Va Bloom! 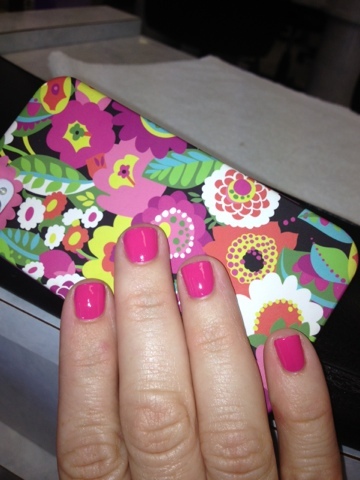 The phone cover seems a little muted, but I love a bright pink like this Strawberry Margarita OPI polish! Vera Bradley at Isetan Shinjuku's "The Stage"